Spring is a time to leave behind the mundane and catch up with friends and family. It is also a time to eat delicious fresh food at spring parties! With so much lined up right from Easter to Mother’s Day, the social calendar is usually full, and a party that is the talk of the town sure ups your popularity quotient. In a skillet, heat olive oil and butter. Add garlic and cook till it softens. Add the greens and stir well. Add salt to taste and cook, stirring occasionally till greens wilt. This should take around 5-7 minutes. Ensure that all the liquid has dried up. Preheat the oven to 425 degrees. Roll out the puff pastry on a lightly floured surface. Place the pastry sheet into a pie plate and trim the edges. Scatter the goat cheese and parmesan in the crust then top it with cooked greens. Whisk the eggs, heavy cream, nutmeg, salt and pepper in a mixing bowl. Pour this mixture over the greens. 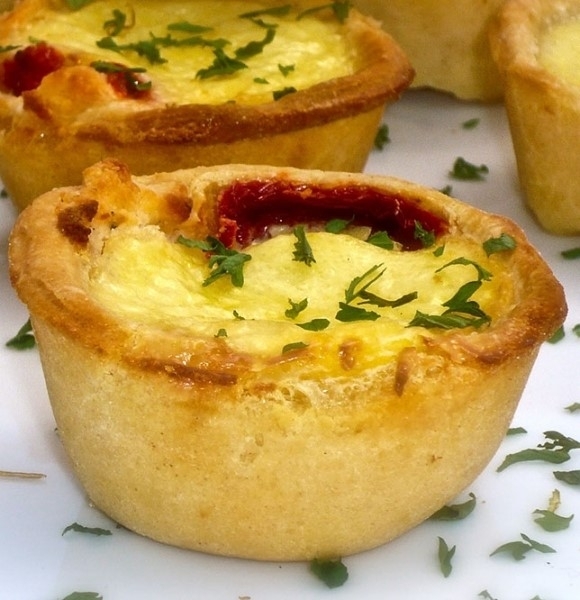 Bake until the crust is golden brown and the quiche is set. It should take about 20 minutes to set. Slice it into wedges. The recipe takes about 30-35 minutes. However, if you are short on time we have a frozen version of Goat Cheese Quiche or you could try our frozen party appetizers. Cook chicken along with chicken bouillon in a pot of water. Boil the chicken until it is completely done. Once the chicken cools, shred it into bite size pieces. Combine the shredded chicken, red hot sauce and mozzarella cheese. Place a bit of chicken mixture into the spring roll and roll it up. Secure the spring roll with beaten egg. Heat oil to 350 degrees and fry the spring rolls. Drain the fried spring rolls on paper towel and serve. This recipe serves 12 and takes around 45 minutes to prepare. 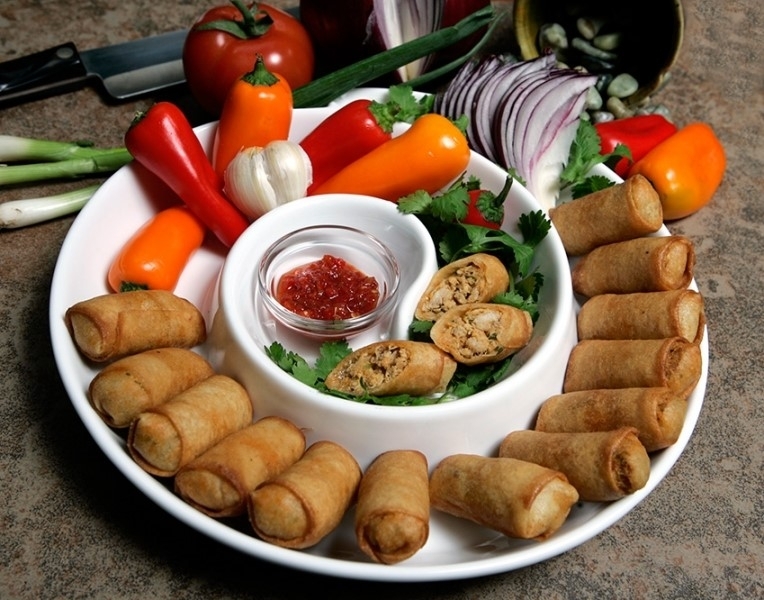 If you need to make it for a larger group you can try our frozen finger foods. We have a party pack of frozen Buffalo Chicken Spring Rolls to serve 40. These can simply be fried or baked at 350 degrees to serve tempting spring appetizers in a jiffy. Make a fine paste of oregano and half the garlic. Combine this paste with 1 cup olive oil. Add salt, lemon juice, and pepper to this. Cut the remaining garlic into thin slivers. Take the lamb and make slits all over the meat. Push the garlic slivers in it. Cover the lamb with the oregano-garlic paste. Once the paste is well smeared all over the lamb, sprinkle a generous amount of salt and pepper. Marinate the lamb, covered, in a refrigerator or at least 1 hour. Ideally, keep it overnight. In a roasting pan, add some olive oil and roast the lamb from all sides. Let the lamb be brown from all sides. Transfer this to the oven and let it roast for 1 to 1 ½ hour. The meat should be pink in the center. Cut the lamb pieces and place it in the center of pita bread. Top it with lettuce, chopped tomatoes, and tzatziki. For Tzatziki, simply combine all the ingredients and mix them in a mixing bowl. Let it refrigerate for at least 1 hour. While this spring finger food is extremely popular at parties, the whole amount of time that it takes in preparation isn’t everybody’s cup of tea. 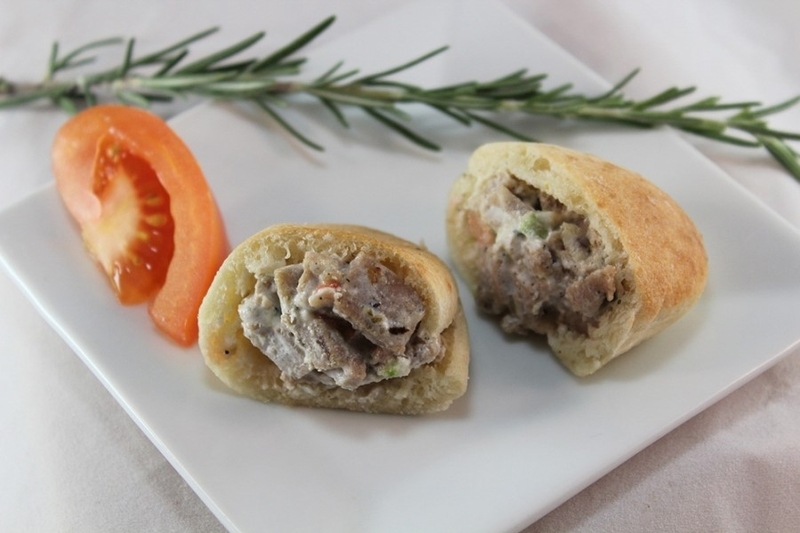 Try our frozen version of roasted lamb gyro recipe instead. An equally delicious spring appetizer that’s easier to lay out and can be ordered in bulk for larger parties. These are appetizers add a gourmet experience to your party. We offer these and many more appetizers in the form of frozen finger foods. Simply buy the party pack and follow the instructions to get gourmet appetizers ready in an instant. Apart from savory foods we also offer a large selection of spring dessert options. Right from cherry blossom tarts, French macarons, cake pops to baklava we have got you covered.